The shocking violence of the most recent mass shooting in Las Vegas can leave us questioning the goodness of humanity, whether the world will ever feel safe again, how we will ever begin to understand the decision to end the lives of our fellow beings. We may begin to feel hopeless, anxious, unsure about the future. We may turn inward, away from others, in an effort to insulate ourselves from risk. But as the quote above suggests, we need hope more than ever when tragedy strikes. 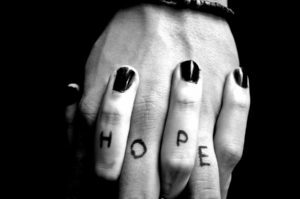 We need the hope that drives us forward, moves us toward one another, rather than away. We need the hope that encourages us to listen — really listen — to differing opinions with openness and curiosity. We need the hope that challenges us to choose love over hate, to trust instead of fear, to believe that the things that humans share — the longing to love and be loved, to be heard, to have purpose — far outweigh those things that divide us. We must cling to hope like our lives depend on it. Because, indeed, they do.